​Our newsletter is published at the beginning of the month. Here are your headlines from the month of April. "I sat for the Series 99 and passed on my first attempt! I am thankful for the Solomon preparation. The four-week study schedule was a life saver. 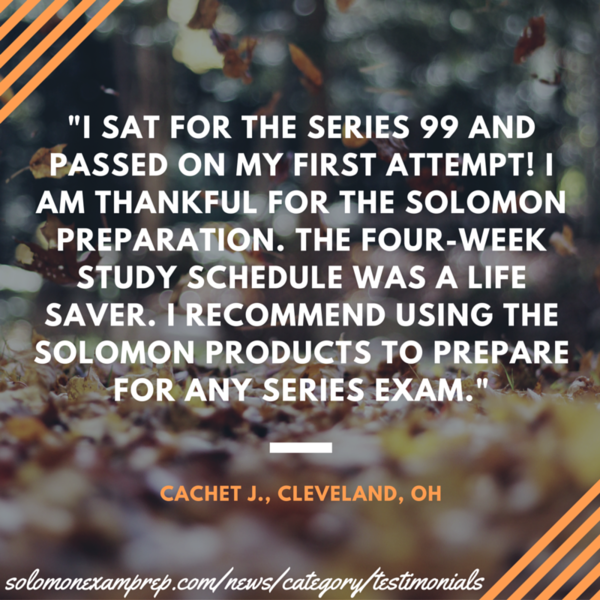 I recommend using the Solomon products to prepare for any Series exam." Question: Which of the following would most likely be classified as a branch office? Congratulations to Alexa M. this month's Study Question of the Month winner! Solomon Exam Prep is excited to offer Live Series 6 and Series 63 Classes in Portland, Oregon June 15-17, 2016! The Live Class Package not only includes your admission into the class, but also our digital Exam Study Guide and Online Exam Simulator. The live, in-person classes will cover the major topics you will encounter on these exams. VIDEO: Today marks the one-year anniv of the FINRA Securities Helpline for Seniors!